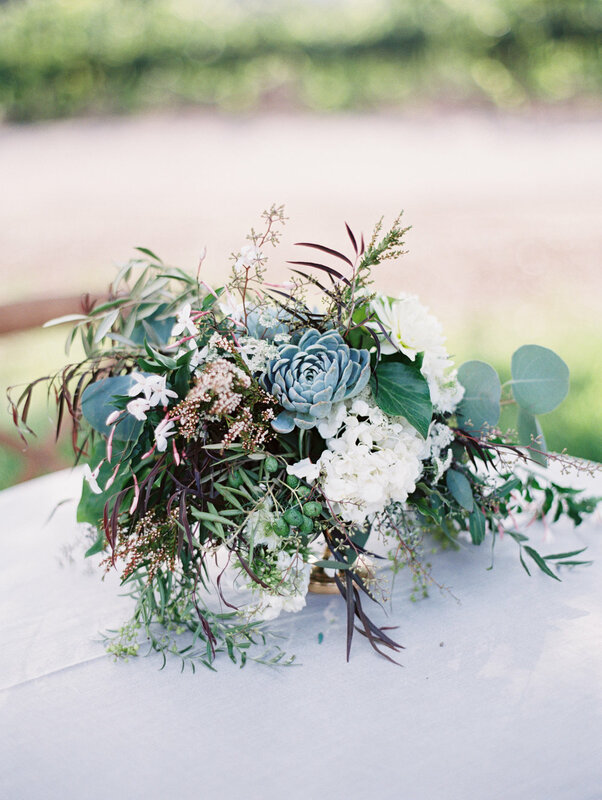 This elegant wedding was held at Firestone Winery and Vineyards in Santa Ynez. The bride chose a stunning Jenny Packman gown with gorgeous beading and paired it with an elegant chignon. Shades of gray were chosen as the color palette, with pops of green and white. The bridesmaids dresses kept with the theme, all wore long gray dresses ranging from a darker blue/gray to a soft, light gray. The ceremony arbor was kept organic with a oval top made out of branches and garlands coming down designed by Anna Le Pley Taylor. After the vows, guests moved to the courtyard for cocktails and dinner. Tables were draped in a soft gray linen and green centerpieces featured olive branch and succulents. Other tables featured organic garlands with more olive branches mixed with mercury glass candles. And in lieu of a traditional wedding cake, the couple opted for a literal cheese cake, made out of cheese roundels. All was expertly planned by Soleil Events and captured by photographer, Kurt Boomer.